An Excalibur 2400 4-Tray Economy Dehydrator is a mid-range food dehydrator that comes at a very affordable price. This appliance is impeccable for any person who is eager to get all the benefits of a food dehydrator’s features by spending very less money. This model will also assist you in simply avoiding the excessive salt, harmful chemicals as well as toxins that are normally contained in the dehydrated foods that you get from the shopping stores. You will make a wise investment by purchasing this appliance as it helps you in evading numerous kinds of diseases and health disorders like high (B.P) blood pressure, obesity, etc. In fact, many nutritionists also recommend that weight watchers should substitute their sugary and calorific appetizers with the healthier snacks such as dried vegetables, dried fruits, kale chips, etc. Even kids can also use Excalibur 2400 4-Tray Economy Dehydrator for preparing various dishes constituting of dried fruits or vegetables. As this food dehydrator is intended to preserve the maximum amount of vitamins and minerals, so you can be assured that your children will definitely get their complete nutrition in a day. One more important thing about this appliance is that it is designed to dehydrate numerous kinds of food, comprising of herbs, meats, jerkies and spices. You can also dry out many types of non-eatable food like clay decorations and structures, room freshener and flower petals. It is a perfect food dehydrator appliance for any new user. Due to the presence of horizontal (back to front) air flow structure, there is an even distribution of the heat through entirely the food trays. As a result, you are not required to open the appliance’s door persistently to swap the trays for certifying the uniform heat distribution. It is also significant that heat gets disseminated equally all over for an impeccable drying process. The 2400 4 Tray Economy Dehydrator basically originates with four trays and you cannot expand its capacity. Some people have complaints about this feature of the appliance but we think that it is best appropriate for a smaller family. You can dehydrate four different food items on four diverse trays. This food dehydrator comes with an adjustable thermostat feature which can be suitably set between 95 degrees F to 155 degrees F that gives you a control over the whole dehydrating process. Every food item requires different temperature settings i.e. sometimes low for the delicate food items and on some occasions high heat for the food like jerky. So, an adjustable thermostat setting helps you in providing accurate heat to the desired foodstuff. The cleaning procedure of this food dehydrator is quite simple because it is essentially equipped with poly-screen tray attachments. In addition to this, the trays of this can be easily washed in a dishwasher. This helps you a lot in saving your lot of time as you do not have to go for a tiresome cleaning work. The buyer of this product can also purchase additional accessories along with the food dehydrator i.e. ParaFlexx premium sheets, non-stick sheets as well as the ParaFlexx reusable silicone non-stick sheets for fruit skin. The 2400 excalibur 4 tray food dehydrator belongs to the category of a box and shelf food dehydrators. It looks like an electric oven in which the heat is distributed evenly over all the trays. The air in this appliance flows ﻿horizontally i.e. from back to front. It guarantees that all the food gets dehydrated equally. The temperature of this food dehydrator ranges from 95°F to 155°F. So, you can modify it according to your requirement. 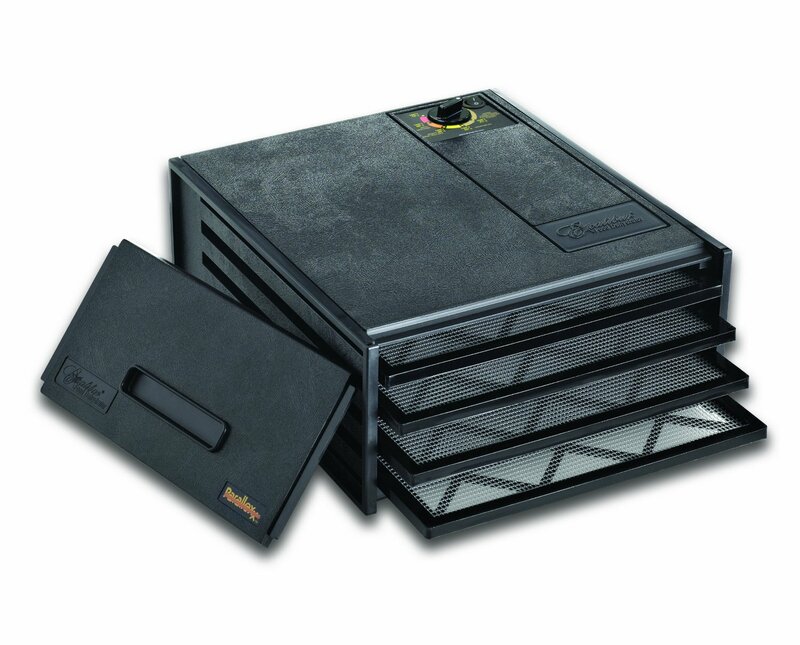 The dimensions of Excalibur 2400 4-Tray Economy Dehydrator are 16.2 x 13 x 6.5 inches. The approximate weight of the excalibur food dehydrator model 2400 4 tray is around eight pounds which make it very lightweight to carry from one place to another. This appliance comes with four trays that cannot be expanded at all. The power capacity or wattage of excalibur dehydrator 4 tray 2400 is 220 watts. The buyer of this product will get five years limited warranty period in consort with this appliance. If you are a new user of this appliance, then you do not have to worry as a manual is also provided along with this dehydrator. The Excalibur 2400 4-Tray Economy Dehydrator includes an array of four mesh trays which are not only easy to clean but also keep it away from dipping over each other through the trays. Due to the presence of poly-screen trays, a person can even dehydrate small size items like herbs or flowers. Due to the small size of this food dehydrator, it is very easy to store this appliance. You can easily fit it into any regular sized kitchen and also in the smaller kitchens of the apartments. A family of three or four who has a minimal requirement of food, this product is the perfect option. Since there is smaller size of the fan and lesser wattage capacity, the Excalibur 2400 4-Tray Economy Dehydrator is considerably less loud than the other influential models. So, you can use this appliance at night in your home without disturbing the other family members. It is not at all difficult to use this food dehydrator as it does not come with a lot of controls. Due to the correct temperature controls, you can easily dehydrate vegetables, fruits, meats, herbs, flowers, pet treats and much more. You do not have to move or rotate the trays in between the whole process. Since this appliance is not very bulky or big in size, so you dot require any kind of helping hand while moving this product to any place. It also does not need much space in your kitchen. The Excalibur 2400 4-Tray Economy Dehydrator is astonishingly lightweight due to its size. It weighs around eight pounds only and its dimensions are16.2 x 13 x 6.5 inches. Hence, this makes it very easier to move this appliance if you need to alter your dehydrating environment. Since the trays of the product are easily detachable and accessible, you can clean them effortlessly. The number of trays is also not much, so you do not have to spend much time in the cleaning of the appliance. Since the power capacity of this food dehydrator is 220 watts, it does not consume much electricity during the dehydrating process. So, this also saves you lots of money that you may have to spend while paying the electricity bills. This is a great appliance for the new user as it is not much complicated to use. It is not also comprised of many controls. A guidebook is also provided along with the appliance so that you can use the product wisely and easily during the initial stage. If you want to make more space in the appliance or wishes to dehydrate a bigger size food item, you may remove the trays and create more space. This will enlarge the dehydrating chamber. One of the biggest disadvantages of the Excalibur 2400 4-Tray Economy Dehydrator is that if you want to dehydrate large quantity of food items for your family or for a gathering at your home, then it will not be possible with this appliance. The size of this product is perfect for the smaller families. The temperature alteration feature on this appliance is extremely unpredictable. It becomes quite difficult for a person to judge that what temperature is required for a particular food item. If you are a new user, then it will be difficult for you to know all the settings whereas an experienced user will still have the idea about the requirement of temperatures. The Excalibur 2400 4-Tray Economy Dehydrator is manufactured mainly of plastic material. So, if you are looking for an elegant, stylish and robust food dehydrator, then this product cannot be your first choice. However, these factors do not affect the overall functioning of the appliance but it might not meet give you full satisfaction regarding the material and appearance. Due to the presence of a feature of vertical drying, it is required to rotate the trays at regular intervals for the even drying of all the food. The food which is near to the source of heat gets dehydrated quickly as compared to the other food stuff. As this food dehydrator is without a fan and a feature of an adjustable thermostat, your food will get dehydrated at very slow speed. So, sometimes this can also spoil your food or does not perform a uniform drying. Owing to the round from of design along with the cuts off in the corners, the total drying area of the product gets reduces. So, you will get very less area during the process of dehydration. Due to the non-modifiable stackable design, this appliance has a restricted size of the dehydrating chamber. So, you cannot expand it more than the four trays. The Excalibur 2400 4-Tray Economy Dehydrator does not have an inbuilt timer so you have to manually on and off the power button of this product. But, you can utilize any extra timer during the use of the appliance. Q: Does the Excalibur 2400 4-Tray Economy Dehydrator BPA free? BPA (Bisphenol A) is a kind of plastic material that does not release any harmful toxins when gets heated up. But, I think that Excalibur 2400 4-Tray Economy Dehydrator is not BPA free. Q: Does this food dehydrator make any noise while preparing any food item in it? No, the Excalibur 2400 4-Tray Economy Dehydrator does not create any noise when you are using it. This is a big advantage of this product. You can even use it during the night without disturbing the other family members in your home. Q: Is there any timer on this food dehydrator? No, there is no timer or ON/OFF button on this appliance so you have to manually plug in or plug out its power socket. You can buy an additional regular timer from the market and use it during the dehydration process. Q: What will be the temperature settings of this product i.e. from lowest to the highest? The temperature setting so the product varies between 95 degrees F to 155 degrees F.
Q: Does this appliance come with detachable mesh screens as well as non-stick sheets? Can I use it for making flax crackers? Yes, you will get detachable mesh screens along with this product. But, no non-stick sheet is given with this food dehydrator. However, you may also use parchment paper in substitute to the non-stick sheet. These work perfect for making flax crackers. Q: How much is the power capacity of Excalibur 2400 4-Tray Economy Dehydrator? The power capacity of this appliance is 220 Watts. Q: Would I be able to fit half pint mason jars for in this small size food dehydrator for culturing yogurt? Yes, you can easily fit half-pint mason jars in this product by removing its all the trays. Q: Can I prepare beef jerky in this particular appliance? Yes, this food dehydrator works great while preparing beef jerky. But, you have to remember on an important thing that the meat should not be drippy. Q: I am little bit confuse as the Excalibur 2400 comes with a feature of temperature settings. But how will I remember that at which range of temperature has to dehydrate a particular food item? A manual book or a g﻿﻿uidebook is also provided along with the product that will assist you in setting the temperature and in knowing the requirement of the food item. Q: What will be the size of the slide-in trays for the Excalibur 2400 4-Tray Economy Dehydrator? The size or the dimensions of the slide-in trays are 12 x 12 inches that are quite sufficient. Q: Do the trays of this appliance are made up of stainless steel material? No, the trays are made up of plastic material. In fact, the entire body of the appliance is of plastic material except the electrical elements. Q: Where does the motor or heating element of this food dehydrator locate? The motor is situated at the back of the unit and it blows up from the back. Q: Can I prepare fruit roll-ups in Excalibur 2400? Yes, you can effortlessly prepare fruit roll ups in this food dehydrator and can serve it your friends and relatives. Q: Is this appliance available in all parts of the world? You can check the online shopping websites regarding the availability of this food dehydrator in your city or state. Q: Does any person have used Excalibur 2400 to make a bread or yogurt? You can try this but till now If has never seen that any person has prepared a yogurt or bread in this appliance. Q: Can we replace the trays of this appliance in case of any breakage? The Excalibur 2400 4-Tray Economy Dehydrator does provides replacement trays in the sizes of 11 x 11 as well as 14 x14 inches. Q: Does this food dehydrator consist of a fan? Yes, there is a fan of four inches size in this appliance that evenly distribute the heat all over the food items. Q: I want to prepare a large quantity of food for my guests. Can I prepare that much quantity in this food dehydrator? You can prepare the meal for 4 to 5 people in this appliance. But if you want to make food for a gathering at your home, then it would be advisable that you opt for some other bigger size food dehydrator. Q: Can we add more trays in the Excalibur 2400 4-Tray Economy Dehydrator? No, adding more trays is not possible in this product as it cannot be expanded in size. You have to use it with the all the four trays that are given long with this food dehydrator. Q: Can I prepare different types of meat snacks and dishes in this appliance? Yes, of course, you can make any kind of meat snacks or a dish in this product very easily. You have to prepare them in the high-temperature settings. So, please look out for all the temperature requirements that are given in the manual book. Q: What is the full height of the Excalibur 2400 4-Tray Economy Dehydrator? The full height of this food dehydrator is approximately 6 inches high which are quite enough. Q: Can you tell me that what is the amount of space in inches among shelves? The amount of space between the shelves will be around 1 ¾ inches. Q: On the box of the product, it is mentioned that 110-220v or 110v only, what does it mean? 110 Volt only proposed for usage in the North America region. However, Excalibur does not acclaim that you use its appliance with a converter in some another nation as it will harm the motor-powered and result in early failure. In such situation, a warranty can also get invalid. Q: What is the size of non-stick sheets for this food dehydrator that is companionable with this small size model? The size of the non-stick sheets that are compatible with this appliance is 12 x 12 inches. Q: Does the fan of Excalibur 2400 4-Tray Economy Dehydrator is made up of plastic or metal? The fan is manufactured from a durable quality of plastic and rest of the elements in the appliance are made up of metal except its body. Q: Will I get non-stick sheets along with this appliance if I buy it? No, these sheets are not provided along with this food dehydrator. However, if you need non-stick sheets, then you have to buy it additionally from the market or through online shopping websites. Q: Do I get any warranty period benefit with this food dehydrator? Yes, you will get five years limited warranty period on this appliance from the manufacturers of Excalibur 2400 4-Tray Economy Dehydrator. Q: What are the dimensions of this food dehydrator? The dimensions of the product are 16.2 x 13 x 6.5 inches. Q: What is the approximate weight of this appliance? The estimated weight of this food dehydrator is eight pounds that make it quite lightweight for easily moving. Q: I am a new user of this product and do not have any knowledge regarding the usage of this appliance. What should I do now? First of all, you do not need to get worried as you will get a manual book along with this product that will guide you step by step. So, you can follow the instructions and can use this product effortlessly. The Excalibur 2400 Economy Dehydrator is the best appliance for the people who are just starting food dehydration at their home. People are also becoming more health cautious these days and also got affected by a number of diseases also. So, with this food dehydrator, you can prepare a variety of food items and can serve you family with the nutritious food. However, if you do not pay attention to the negligible obstructions, then there will be no single reason that you do not like this food dehydrator. You will get complete instructions in the guidebook of the appliance. At present, this is the best product that is available in the market and is equipped with so many features at an affordable price rate. Although, there are few minute shortcomings about this appliance, but with the advantages of reasonable price as well as a limited warranty of five years this product is highly recommendable.